The following text is a translation of the personal account “Volar de nuevo”, published in La luz que nos queda (Sisma Mujer, 2017). 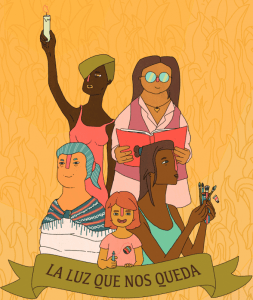 This is a book with the personal stories of survivors of conflict-related sexual violence in different parts of Colombia. My story speaks of violence, but also of family traditions and of black resistance – something we don’t hear a lot about. Alicia was born in Buenaventura, Valle del Cauca, on 8 September 1971, as the only daughter of Carmelo and Amanda. She comes from a long line of only children, which lead her to occupy a space of privileges and affection in her home. Alicia’s parents met when they were quite young. Her mother, at just 15 years old, died after giving birth to her. Her father went in another direction and decided to follow his own path without Alicia. Her grandparents, as well as her aunts, were left in charge of her care and affection that, being a little girl, she desperately needed. She grew up with the support of her family, with a network of women who protected and spoilt her constantly. Of her childhood she remembers that the days went by alternating between cuddles and hugs, between her maternal and paternal family. Her grandmothers, who she started to call ‘mum’, tried to give her the best in terms of education, shelter, food and recreation. In her childhood there was no hitting nor violence, only games, laughs and care. For the women of her family, education was a fundamental tool of liberation necessary for a better future. Of this Alicia remembers the books, the school and the tutor who would reinforce what she learnt in class. When she was 13, her ‘mum’, who was really her grandmother, died, and she then found out that her grandmother had not known how to read or write. Because of this her grandmother had decided not to repeat this same mistake with the following generation; she was determined to give them an education, regardless of the sacrifices that were needed to achieve this. Alicia grew up in a homely family environment. This made her happy. In a time of single-family homes, she was close with her aunts and cousins. She doesn’t remember a moment of loneliness. Her nanny, tutor, aunts and grandmothers always accompanied her. I never knew what racism was. Nobody told me that in my house I was different, nor did they make me feel like it, nor did I look in the mirror and see somebody different from them. Alicia had inherited the dark complexion of her mother, whereas her family on her father’s side were fair-skinned. But the differences of skin colour weren’t notable in a family environment shaped by love and respect. She had many toys: bicycles, rollerblades and a dolls house where she could delve into any world of her imagination and, with her cousins, recreate the happiness of their childhood. She learnt to embroider thanks to the women of the house who knew that not only a professional career was necessary, but also crafts. As if they were anticipating the future, the women in the family started to educate the younger generations, where Alicia occupied a privileged position, perhaps because they knew that in the future things were not going to be like the happy bubble that they had experienced as children. As a child she travelled to other countries, she roamed other worlds guided by her grandmother, who was always by her side caring and protecting her from any little thing that would cause her harm. She grew up with matriarchal women, who took the reigns of an enormous family. They raised many nieces and nephews, who were lucky to be raised with the encouragement and strong voices of these strong women and who were changing history through pushing forward education as an important pillar in their family. Her life was within reach of Buenaventura with its complex social, political and economic problems. Her grandmother and her aunts tried to avoid these problems, in order to give a happy and simple childhood to the girl that they loved so much. 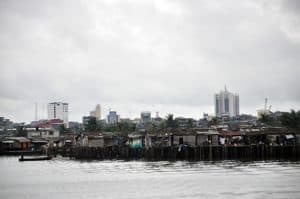 The ups and downs of Buenaventura did not reach their united home and family, which did not experience the violence and poverty of the surrounding area. Buenaventura is Colombia’s most important port city. 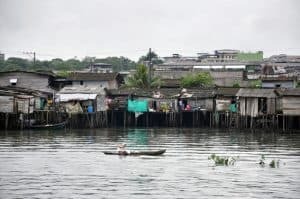 Despite its significance for international trade and tax revenue, Buenaventura is one of Colombia’s least developed cities and communities are affected by the lack of basic services and the presence of illegal armed groups. Whilst she was educated and looked after by her grandmother, Alicia’s father started another family where he had more daughters, but for reasons of protection, her family decided that she mustn’t get to know this family, nor get close to her father. Alicia had parties and happily celebrated life. The only thing she couldn’t celebrate was her graduation from her degree in Business Administration and Finance, because her grandmother who took care of her, started to get ill and her diabetes worsened. This was around November 1992, when Alicia was 22. They were living in Cali at the time, where her grandmother had bought a house so that she could grow up happily and in want of nothing. Her enjoyment of this was short-lived when her ‘mum’ became ill. The war was near, soon it would knock on Alicia’s door and she would get to know that beautiful but dangerous Buenaventura, filled with its difficult problems. The magic and the colours of childhood started to be tainted with the grey of war and drug trafficking that lurked in the streets of Buenaventura. The war reached Alicia’s family. It wiped out most of the men in her family. The first of them was her uncle, who was one of the few in her family that had decided not to study, working as a taxi driver in Buenaventura. He was an atheist, and this caught Alicia’s attention who, tired of the gruelling masses and all the saints to which her grandmothers would pray, saw in her uncle a distinct and irreverent man. The reality of violence and drug trafficking was no longer hidden from Alicia’s family. The boat Riviel, famous in Buenaventura, was a wooden boat belonging to Alicia’s family. Illegal armed groups wanted to use this boat for their drug trafficking activities. When the family denied them use, the boat was destroyed. Towards May 1993, on Mother’s Day, her uncle left to work in the taxi to earn money for the family. A group of paramilitaries approached him wanting to take a trip like any other passenger. My uncle disappeared on Sunday, 7 May, on Mother’s Day. He went to drive some passengers, and everyone saw him going up. To “go up” is when someone leaves Buenaventura in the direction of Cali. It was 8pm, 9pm, 10pm and nothing. He was a family man, he had back problems and couldn’t spend too many hours in the taxi because of a spine surgery. My uncle disappeared for about three days. They tortured and dismembered her uncle and delivered his unrecognisable remains in a plastic bag. Her aunt became a widow and he left a daughter. The facts indicated that he had been killed by the paramilitaries, so they went to report the case. 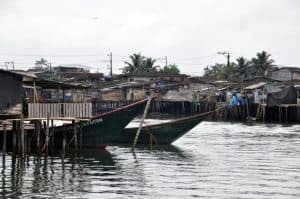 The men of the family were at risk: another uncle, who had been in charge of the Riviel boat, had had to leave Buenaventura because of the threats from illegal armed groups, as he had not let them use the boat for a drug trafficking route. And now the death of her uncle gave an indication of the atrocities that were starting to threaten the family. The women, more involved with household chores, were not familiar with the world that was moving on the town’s streets. Ñata, as they used to call her, stayed alone in the house on the day of her uncle’s wake, until the rest of the family arrived. Three men on motorbikes arrived at the wake and started to shoot. Each man went to protect a woman. That was where they killed Pedro, husband of Alicia’s aunt Allba; Jonathan, son of her aunt Claudia; uncle Noe; Patricio, son of her aunt Rigoberta and her son Tomás. Alicia’s cousin was saved, thanks to his brother, who protected him and was then himself hit by a bullet. Moments of terror and sadness arrived, the men had to leave the town because of threats. The women stayed to continue taking the reins at home. It was evident that those atrocious acts had not been a personal matter as the newspapers claimed. Her grandmother, the matriarch of the house, due to her ill health, stayed to support the women, giving them strength and encouragement, telling them that this was the moment to move forward, to not allow defeat. However, in July 1993, she suffered a heart attack and died. For Alicia the world took a turn which left her disorientated and ungrounded. When she was born she had lost her biological mother; at 13 she lost her second mother and now, at 22, she had lost her third mother, who had looked after, protected and loved her. She was her rock, she had given her all she needed to be happy and not to suffer, but now, without her, life was hard. Sometimes we have to move away from the nest where we feel comfortable to be able to fly again. Alicia arrived in Cali with the hope of a better future. Her Aunt Claudia continued to care for her and be her support. The family ties continued to carry and shelter her for those days when life was hard. Courage and a desire to move forward were her new horizons. Her grandfather, who was like a father, was a carpenter and he used to give the money he earned to his wife so that she could organise the finances. She had been the one who had organised all matters of the home. So, after her death, he entered a moment of crisis when he did not want to continue living. His zest for life began to deteriorate. For Alicia these were moments of uncertainty, she had to take the reins of the household, of which she had been left in charge. She had to learn to cook, clean and manage the family’s finances. The enormous house where she passed her childhood years seemed empty without her mother. So, Alicia and her grandfather decided to rent a room, where they lived for three months to keep him company in his sadness and loneliness. Her grandfather, who smoked quite a lot, started to have trouble with his lungs. He divided the inheritance of his three children and, of course, Alicia, who had become another daughter. With this money, each child bought a house and created their homes. Alicia decided not to have children but took care of her nieces and nephews. Each one received something from the inheritance of the enormous house, but Alicia only wanted to keep the family photo albums. Looking over them comforted her and allowed her to travel to that happy childhood. Her grandmother’s death was followed by four years of mourning, during which the family visited the cemetery together. Alicia started to work in a school. Her grandfather lost his Colpuertos pension because the company went bankrupt and did not pay it to him. By this stage Alicia started to care for Aunt Claudia, who despite having her husband and children, was not being looked after by them as they were not being attentive to her well-being. Jonhatan, the oldest son, used to provide for her, but he was one of the victims of the paramilitaries – they had killed him. The family began to grow apart, some went to Pereira. The war was breaking up the family ties that had united them before. So many losses of loved ones meant that each part family followed its own path. The threats wouldn’t cease, our authorities were not paying attention to us. Now that my ‘mum’ had died, we were disorientated, my ‘dad’ didn’t want to live, especially after he had lost two brothers, a nephew, a grandson, a son-in-law and his wife. Alicia started to take the reins at home, to take care of her nieces and nephews, to continue with the legacy that had prioritised education. It wasn’t easy to assume the role of her adoptive mother but, little by little, she started to attend to her nieces and nephews in a loving way. She was dismissed from the school where she worked in Buenaventura, because she was perceived as a target for the paramilitaries and therefore a threat to the school. So, she returned to Cali. It was a reawakening and an opportunity to assume the daily challenges. There she worked as an administrator of a company. The things she had learnt from her family started to help her to move forward. She was able to face difficult moments and with the strength of this Buenaventura nature that ran in her blood, under no circumstance did she relent. She had made of me a useful woman in society and I had to continue ahead (…) Until today I have continued to care for my Aunt’s home, I raised my nieces and educated them. I was able to make a home and I believed I wouldn’t be able to do this. I was able to assume the responsibility for the family that I have today. The women of her family continued with the task of strengthening their children and to build up the union that they had learnt so much about. Education was their fighting flag, they knew that this was the key tool to get ahead, this was the most important legacy for the next generations. So, the violence didn’t defeat them, and they continued ahead, they only looked back to remember the teachings of a past that had been filled with happiness. Violence was one of the ways of mobilising ourselves because, if it had not been like that, I believe that we would still be in the same vicious cycle. Everybody started to search for new horizons, to look for opportunities. Alicia began to share her inheritance between her father and aunt, because her father had not invested the money well and had started to ask for loans from illegal armed groups, those groups who threatened you if you didn’t pay the totality of the debt. Her aunt didn’t know how to manage finances,so Alicia had to help her provide for her children. They tried to report these acts, which again were related to the paramilitaries. However, it was impossible, because the money that was lent to locals came from drug revenues and for the illegal armed groups a police investigation created a high risk of being sent to prison. Therefore, they threatened the judges who were involved and that was the end of the report. Alicia’s family lived towards the side of the island of Buenaventura, surrounded by water and near the fishing port. The port was known to be where the illegal armed groups operated. Numerous incidents of sexual abuse started to occur in the zone. Up the road from where we lived they sexually assaulted a girl who I remember was called Marisela, some men from an illegal armed group raped her. She was a young girl, 17 years old, she was underage. Honestly what I thought in that moment, I didn’t say this to my aunt, but I thought that she had brought it upon herself, she was a young girl who wore short shorts. Later, after I lived it, I had to take back my words. The latent threat forced Alicia to leave her beloved Buenaventura, she wanted to take her Aunt Claudia, the only family member who had stayed there, to continue caring for her, but love for her hometown and the desire to continue preserving the home she had built together with her husband made her aunt stay in Buenaventura. Alicia left for Cali, searching for a new life, far from the terror, anguish and death. She loved her Aunt Claudia, she was like all the older women in her family home, close, warm and always had an encouraging and caring word to say. This is why Alicia provided for her care, and she would not stop, even if she went to live in Cali. Alicia’s family had taught her that racism didn’t exist and that the colour of your skin wasn’t important, everyone should love and respect each other. I never knew I was different, I came to know racism later. I realised that because in Valle [del Cauca] there are more Afro-Colombians than anything else, so I never felt different, I had never seen difference, I had never felt it. Later, I had to learn to live with it, to learnt how to overcome this and to insist that the colour of my skin didn’t matter. I had many more things to give in life. She also had to confront paramilitary groups with this strength and courage. One of her nephews, the son of Aunt Claudia, wanted to enter an illegal armed group because he knew with them he would earn a lot of money and would be able to buy the latest brands. Despite his family offering other opportunities like study and work, without luxuries or comforts, the young nephew decided that he wanted to join the illegal armed groups and became involved in the activities of the armed groups and their ‘chop houses’. I had the last word, I told him, well, from here on you are going towards a life of crime, hasn’t there been enough crime and violence already. There weren’t any more people in her family which the paramilitaries could follow, all her loved ones had already been displaced because of the war. Only Aunt Claudia remained, who she visited at the weekends. One of those weekends, the war personally touched Alicia’s body. The men of the armed conflict impressed her skin with marks of violence and abuse. They surrounded me one day in my Aunt’s house in Buenaventura. They said to me ‘good afternoon’, I remember that I was sitting in the living room when I saw the guys, but I couldn’t run because I was on the second floor, so they ambushed me. Whilst these atrocities occurred, her Aunt Claudia couldn’t do anything. At the time the threat had seemed dormant and the terror of a gun to her head made Claudia stunned and unable to move while Alicia was being abused. They were three days of pain, three days deprived of her liberty in her Aunt’s house, enclosed in a room and submitted to sexual abuse by the paramilitaries. It was 1 October 2009 when they retained her and committed such an onslaught of abuse. The first two days she was raped by a man, the chief commander of the zone’s paramilitary group. For two nights and three days she was retained in her aunt’s house, and on the third night she decided to flee, despite the pain she felt in her body. Her aunt eventually brought her food and her uncle didn’t find out what had happened. The paramilitary commander had left one of his men, someone from the same town (Buenaventura), at the door watching Alicia. No one in the family knew what had happened. Alicia left her aunt’s house feeling furious, sad and helpless, not only for the pain of the abuse she remembered, but also for her aunt, who she felt hadn’t looked after her and didn’t look out for her. I told her, you knew what they were going to do to me, but even so, you just stayed quiet. After this, Alicia decided that the justice system should deal with her case. I reported it. I lost my mobile phone, a Movistar, because he told me ‘If you ever say my name I will kill you and I will kill your aunt’. He put a gun to my head and said, ‘Be quiet, or I’ll kill you’, and I wasn’t able to say ‘kill me’; I was paralyzed. I first went to Cali to a cousin of mine, but I didn’t tell her anything. Even so, she asked me what happened. Those men started to call me and threaten me. Alicia didn’t tell anyone in her family to protect them. To her aunt she had the opportunity to say that she hadn’t looked after her, that she knew what was coming, but didn’t warn her. The family still do not know what happened and still wonder about the distance between Alicia and her Aunt Claudia. This incident of the war drew apart another bond in the family. It will still take time to heal these wounds. However, Alicia deep down loved her aunt, but she needed to talk and start to understand what had happened to be able to heal. I was in Buenaventura in June 2016 because I had identity protection from the Human Rights Ombudsman. I went with them to Buenaventura, taking the necessary precautions. I didn’t go to her house, nor tell her that I was in Buenaventura. Alicia has not been able to return for good to her beloved city, where her soul belonged, she has only returned once, with the protection of the Human Rights Ombudsman. After what happened she went to Pereira to stay with a cousin, but she continued to live in fear because of the threats she received on her mobile phone. So, she fled towards Cartagena, but the cost of living there was high. A day of sobbing and hopelessness lead her to take a bus that was going towards Sincelejo, where she lives now. The first day she arrived Don Donaldo Mendoza, a man from her hometown, lent her a hand in solidarity after seeing her crying inconsolably in the park. He took her to a female neighbour of his, who had been displaced because of violence. The solidarity of the town towards the victims of the conflict, allowed this woman from San Onofre, who had been forcibly displaced to Sincelejo, to be received into the community. They understood what she had been through and how tough it had been to leave her roots and come to an unknown place. The tradition of women in her family had left Alicia with skills like embroidering and doing errands. This helped her move on with her life and paid for her bed and board at the Señora Norma guesthouse. She remembered the wise words of her mother, reminding her that even though a profession is important, crafts can save your life. This had proved true for Alicia. Alicia chose not to get in touch with her family again and left her mobile phone at the Prosecutor’s office, because the threatening calls continued and the authorities needed to trace where they were coming from, and which illegal armed group was behind the threats. I spent quite some time without a phone, the Prosecutor’s office took it from me, not only the device but my number as well. I tried to get it back, but Movistar told me that I wouldn’t be able to because the person who attacked me wasn’t only a drug trafficker, but also a paramilitary leader. I received protection measures because I gave the Prosecutor his identity and they verified not only my abuse, but also that of various other women. At the beginning it was difficult to describe the incident, nonetheless, Alicia took reassurance in having her displacement acknowledged by the Prosecutor’s office. At the Ombudsman’s office, with the psychologist Anny Ojeda, Alicia recounted for the first time, between tears, what had happened. They told her that it was necessary to tell all the facts so that the report could move forward, and that her phone number would stay in the chain of custody whilst they did the investigation. Six months in, Señor Donaldo got her work as an assistant in Argelia and, with the dignity that characterises Alicia, she started to become independent and pay her debts. She walked to work to save some pennies to repay those who had lent her a hand. Her family had given her a very good life, but her upbringing meant she knew she had to pass through moments of scarcity. In fact, they offered her the opportunity to leave the country for protection, but she couldn’t stand the idea of being so far from her family and her home country. Because of this she decided to continue living in Colombia. Alicia knows that her aggressor is in prison and that he was a commander of the highest ranks in her region’s paramilitary group. He is imprisoned, they convicted him. I know that the group he commanded is in Buenaventura and that they caught him there. It’s because of this that I, and the other women who reported him, have been given witness protection from the Ombudsman (…) He is the person who started the infamous ‘chop houses’, he is a merciless, cruel and inhumane person. It wasn’t just him either, his whole family were part of the clan. Nowadays, in Sincelejo, Alicia remembers the smell of the sea and the chonta palms of the Buenaventura that she loves with all her soul. She has started building links with her family again, her family who are her pillar and who she loves and cares for, as she was taught to by the women of house. In my family there have been all types of victimising incidents. What’s more, I think that in Colombia to be a woman and to be black implies double violation. Much of what happens to us stays in silence. It is important to collect the stories of Afro-Colombian women, because we have to share our memories. There is a lot to tell and much to learn about the capacity we have had to be able resist and support one another through our families. Alicia, an Afro-Colombian woman, strong and straightforward, has started to smile again each time Buenaventura returns to her heart. Remembering every corner of her home town makes her happy. When I returned to Buenaventura, I was happy, I began to smile again, I roamed through every block and so many memories of my childhood came back, the places, the schools, the corner shops. There are my roots, that is my place.